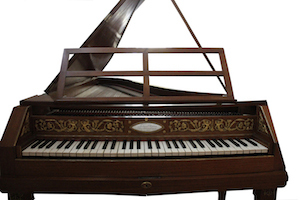 The Laura Alvini collection is comprised of keyboard instruments owned by the pianist and harpsichordist who passed away in January 2005, and has been loaned to the Conservatory of Music Arrigo Boito of Parma since 2007. The purpose of this loan is to make the instruments that Laura Alvini played and cared for to continue living by making them available for the Conservatory's didactic activities as well as for special concerts, events or recordings. The instruments, that represent an important resource for the Conservatory, are kept in the hall titled after Laura Alvini, that houses the Department of Early Music. In 2013, in the occasion of the bicentenary celebration of Verdi's birth, the Conservatory sponsored the integral recording of the vocal chamber music compositions by Giuseppe Verdi, performed with the original fortepiano by Conrad Graf. opus 2772. Curator and scientific-artistic director of the Instrument Collection is Prof. Roberto Gini. 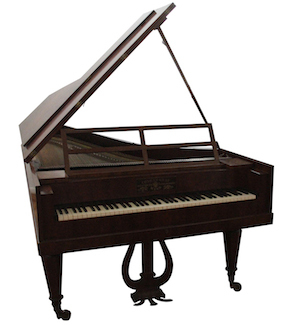 Description: period instrument Clavichord legato with a range from C-f ”', 54 notes. Keyboard covered in ebony with bone sharps . Pine wood case, unfinished poplar cover. 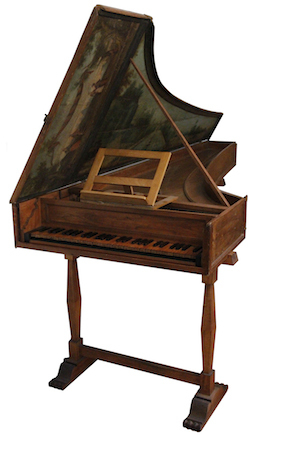 Description: Copy of Johann Daniel Dulcken 1747 harpsichord located at the Vleshuis Museum in Anversa. One keyboard with a range from FF-f extension”', 61 notes, transposable 415-440 Hz. covered in bone with pear wood sharps covered in ebony. Three registers (2x8' and 1x4') insertable by means of knurls on the facade. Pear wood jacks with adjusting screws at the base, ink work in white delrin . Lacquered case and pedestal lacquered on the bottom in tempera and plaster gypsum of Bologna, decorations of the case copy lightly modified from the original, decorated harmonic table with flowers painted by Andre Gori, with gold gilded framed casing. ￼some traces on the front), Front and inner case made from cypress, soundboard made from cypress. The keyboard range is 54 notes, AA-d”’, made from chestnut covered in boxwood while the enharmonic keys are made from ebony. Walnut jacks and registers reconstructed by Formentelli. Two insertable registers (1x8’ ed 1x4’) with handles on the pin block. Brass strings. Tuned to a=392 Hz. 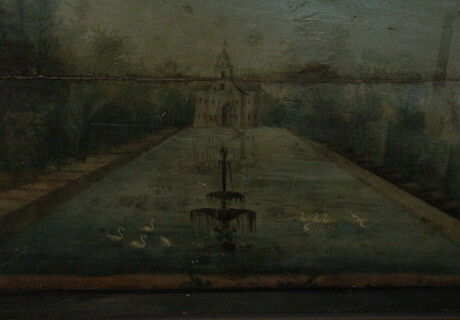 The lid painting is a landscape with a villa in the distance while the flap painting is a depiction of a dance scene. 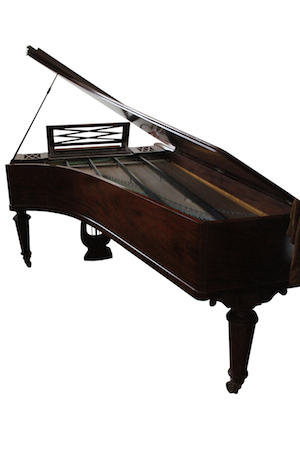 Fortepiano Ferdinand Hofmann 1795 ca. Description: period instrument dated back to circa 1795 by Michael Latcham, Number 9 in the list of 20 Hoffman instruments still in existence. The keyboard range is 63 notes, FF- g”’. 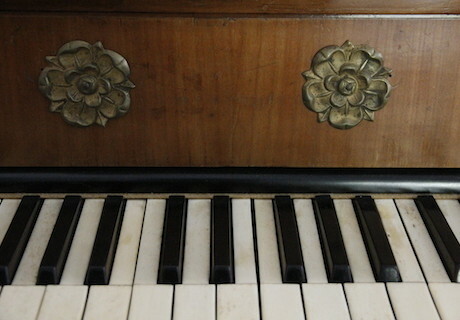 The diatonic keys are covered in bone while the enharmonic keys are made from ebony. 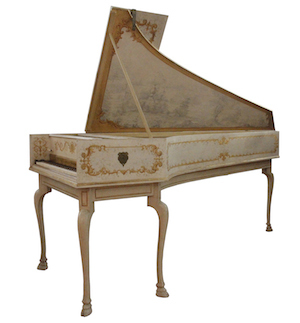 Mahogany veneer case with gilded brass ornamentation in the keyboard compartment as well as column base detail on all four legs. Solid mahogany lid. 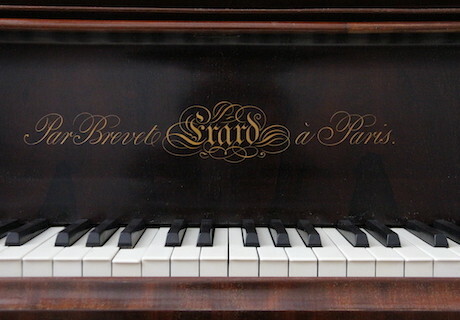 A copper coated plaque bearing the signature is situated in the center of the keyboard compartment. Viennese action with single hammers, manual regulator located in front over the signature plaque, and a knee lever for ‘Forte’ (alzasmorzi). 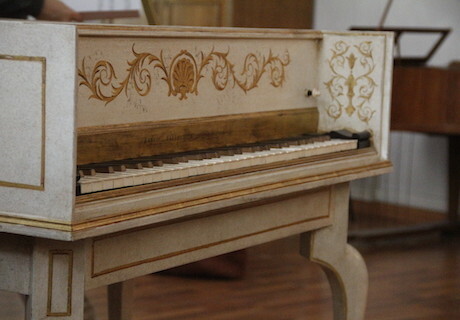 Description: period instrument dating from between circa 1800 and 1808. Of probable Italian origin, the plaque bearing the makers signature has been lost. 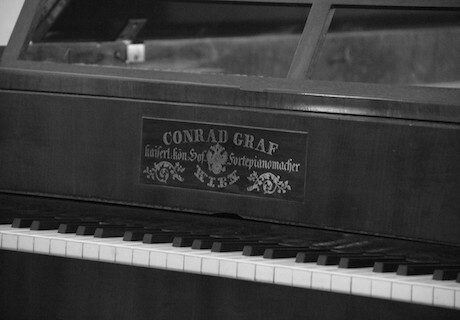 The keyboard range is 68 notes, FF-c”’’. 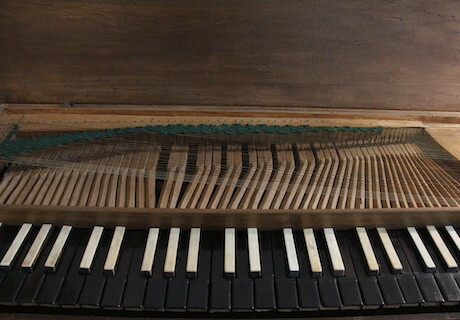 The diatonic keys are covered in bone while the enharmonic keys are made from ebony. Cherry wood veneer case with slight brass ornamentation on the front. 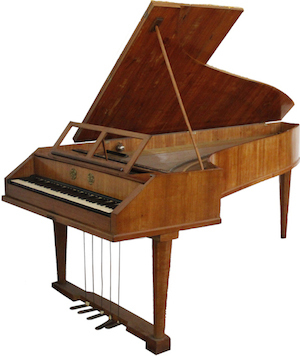 Three octagonal centrally tapered oblong legs, five pedals (fagotto, una corda, forte, moderatore 1) and viennese action with single hammers. Originally built with knee levers and no pedals, pedals were added a few after its construction. ￼(una corda, moderatore, forte). Three octagonal pyramid legs with bronze rings and furnished with wheels. Viennese action. Description: period instrument dating from between 1844 to 1847 (the number of the work is to be verified). The keyboard range is 80 notes, CC-g’’’’. 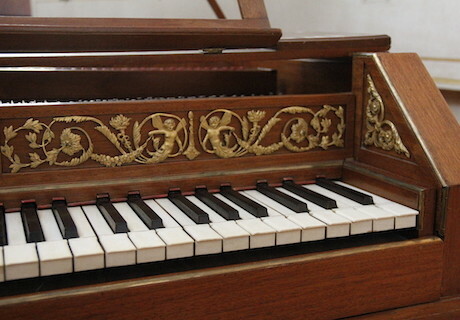 The diatonic keys are covered in ivory while the enharmonic keys are made from ebony. Mahogany featherband veneer case. Three octagonal pyramid legs furnished with wheels. Lyre with two pedals.